LOGAN SQUARE — For anyone still mourning the loss of Lakeview's Uncle Fun, there may be cause to celebrate. 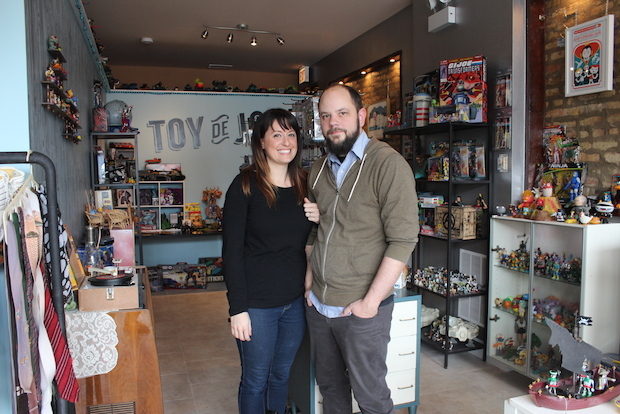 Husband-and-wife team Sam Wells and Liz McArthur have opened Toy de Jour, 2064 N. Western Ave., selling vintage toys and more. They characterize their shop, and themselves, as "Uncle Fun’s nerdy nephew and weirdo niece." The two have long been collecting vintage toys and knickknacks, as well as clothes and jewelry, but until now they just sold items here and there on eBay. They've always wanted to open a shop, they said. "It seemed like it was always going to happen," McArthur said of opening a store. "Then it happened really quickly once it started." The pair got a little help from their friends— in the form of $13,000 raised on Indiegogo — and opened to the public last week. The small storefront between 1st Ald. Joe Moreno's office and a moped store is practically filled to the rafters with colorful vintage toys, clothes and a hodgepodge of other odds and ends, but mostly toys. Anyone in their late-ish 20s to early 40s would likely recognize many of the toys up for sale, which include G.I. Joes, "Star Wars" action figures and even a Cabbage Patch doll still in its package. The store was a natural extension of Wells' passion for collecting toys, which he never really lost after childhood. "I think the toy thing only stopped in high school," said Wells. "'Cause it wasn't that cool in high school," McArthur chimed in as the two stood in their shop Wednesday afternoon. The couple met when they were teenagers in St. Louis nearly 20 years ago. After dating a few years — and after high school worries of being "cool" were gone — Wells finally showed McArthur a glimpse of his toy ardor. "One day, when we were 18, he revealed his G.I. Joes," McArthur said, laughing as she recalled that momentous occasion, "and then he told me all their names — there were like 100." They moved to Chicago a few years later and have spent the last 13 years selling their wares at trade shows, comic cons and online, where Wells kept a blog called Toy de Jour, which inspired the name. Though Wells realizes the "de" differs from the typical French phrase "du jour," he said he picked the name years ago and just ran with it. Though in a way it still works, meaning Toys "by day" instead of Toys "of the day." "I've had the URL forever, and when I searched for it with the 'du' it was taken, so I just kept the 'de,'" he said. As for their new digs, McArthur said they were happy to be on Western Avenue between the Logan Square and Bucktown neighborhoods. The two had always lived in Logan Square since moving to the city, and only recently moved to Humboldt Park. "We really like this area with Margie's [Candies] and Challengers Comics," said McArthur, noting that the owners of Challengers were their friends. "We always said when we opened a store we wanted to be by Challengers." Toy de Jour is located at 2064 N. Western Ave. and is open daily from 11 a.m. to 7 p.m. McArthur and Wells will host a grand opening Friday from 7-10 p.m.